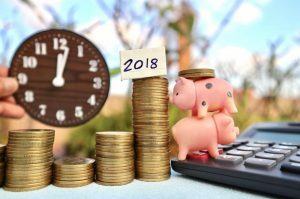 Achieving Your Financial Goals in 2018 – What Are the Tricks? As we have bid goodbye to 2017 and we’ve not only welcomed 2018 but we’ve crossed the first 3 months, it’s high time that we take on the new trials and challenges in order to achieve success. With the passing of every year, each household looks back at every year to check their mistakes, learn lessons from their errors and make sure something good is ahead of them. The New Year resolutions are taken every year but most of them are forgotten soon after the second month of the year is crossed. Most of the time, your new year resolutions are basically same and regardless of whether you call it resolutions or goals, you would definitely love to plan ahead of time. So no matter what your financial goal is, taking the first step towards it is what makes the big difference. When you achieve financial freedom, this is nothing but a stage where you have enough and you know about it. This is the time when you’re no longer worried about your savings as against your expenses. In order to reach this stage, there are different successful steps that you can follow. Before reaching to a conclusion, read on to know more on this. Here are a few habits you should master to accelerate the process of achieving financial freedom. To start off with, it is vital to define what financial freedom is all about. There is no doubt about the fact that each one of us will have a separate attitude towards financial freedom. While there are some who can define financial freedom as a debt-free life, some others might think of it as a bank balance of millions of dollars. What’s your definition of financial freedom? Are You All Set to Define Your Goals? You can definitely set down your own goals for achieving financial freedom because all you have to do is separate the goals based on time slabs and then set priorities. Make a list of those goals which you feel will offer you instant financial freedom and set them apart from each other in long-term and short-term goals. You may even think of investing your dollars to boost your savings. With all these details, you can set the goal every year to accomplish financial freedom. Finance and budget always go hand in hand. You can set your budget for every month, week and also for the entire year. But setting your budget is not enough for you as you also have to stick to it. When you have a budget in front of you, you will always be force to save even more, to spend within your limitations and to pay off the bills all the time. Don’t ever make the mistake of spending a financial life without a budget. Do You Know How to Obtain a Debt Free Life? One of the most vital categories that are often forgotten is the fact that you need to pay off your bills on the right time. You can divide debt into 2 different categories like the one with a higher rate of interest and the ones which carry moderate rates of interest. Those which charge you more than 10% on interest should be categorized under the higher rate zone and they are the ones which are deemed to be dangerous debt. Get rid of high interest credit card debt, payday loans and car loans by seeking help of companies like Northcash which provide you with loans to meet your emergencies. If you have been saving what is left over at the end of the month, this is a wrong approach towards saving. When the month begins, you should first save a percentage of your income for yourself. As soon as you get your monthly salary, deposit 10% of the income to your savings account. Even better, you can automate your savings account so that you can set up automatic transfers to your bank. If your company offers health, life and disability insurance for employees, grab them. Do you have the habit of buying things just because they are on discount and not because you need them? Do you feel the urge of buying clothes whenever someone else around you is buying? Do you feel the need of eating out at least thrice in a week? If the answer to all these questions is ‘yes’, you’re into impulsive buying. You should always spend according to your limit. Don’t buy anything that is beyond your budget only to impress others. Remember that money will always look better in a bank. In what manner do you use your credit cards? Are you aware of the fact that your credit card can also let you save money too? A credit card always assists you in developing and maintaining a perfect credit score. Your credit score will entirely depend on your credit report. All your payment activities along with a credit card will always play a vital role. Hence, when you utilize your credit card in a wise way, you can witness a definite improvement in your credit score. Keep checking your score continuously so that there’s no red mark anywhere. Try to believe in the age-old adage, health is wealth. You will always see that healthy people are the ones who are wealthy. Any sort of workout or exercise will boost your productivity. A healthy person will always take fewer sick leaves and he is way more productive at work than a person who isn’t healthy. So, you also need proper maintenance of your health and diet to remain wealthy throughout your life. So, now that you know the ways in which you can achieve financial freedom, follow them religiously in order to be successful in 2018. Cool Piece Rich. My business partner and I have decided against the usual new year’s resolutions and now write down 5 financial goals for the new year – so far so good! Luke, that is one of the best ideas for beginning the new year! Imagine how much better off most of us would be if we gave up with the annoying old diet and no chocolate resolutions and aimed for financial freedom! As dull as it is, I make a new budget spreadsheet for each new year. It’s the only way I find I can save successfully. That’s the same as me Irfan! With each new year, I start a new spreadsheet for all my finances. Beginning a new spreadsheet is mentally a great concept, as it’s just like turning over a brand-new page in a diary! I swear by my spreadsheet!